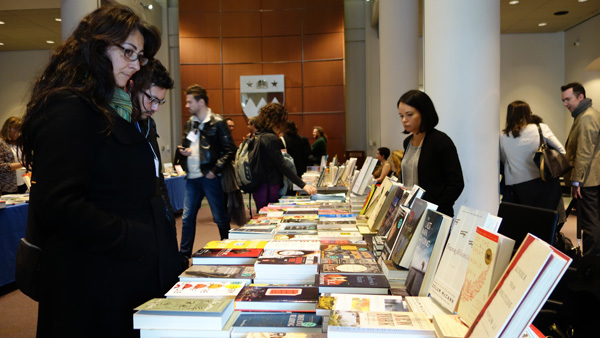 In an attempt to ease the transition from scholar to manuscript peddler, the American Comparative Literature Association (ACLA) sponsored a workshop titled “Publishing Your First Book” during its spring Capitals conference at New York University. 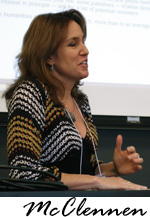 Organizer of the session was Sophia A. McClennen, a member of the ACLA board and Chair of the group’s Publications Committee. McClennen is also Professor of International Affairs and Comparative Literature at Penn State University as well as that institution’s Director for Global Studies. Before you can hope to approach presses successfully you need to prevent your valuable work from escaping into the wild. That means protecting your dissertation from distribution through channels created by the so-called open access movement which—working under the rubric that “information wants to be free”—promotes the posting of dissertations on publicly accessible web sites, making work available to anyone with a twitchy computer mouse. Before participating in such a site, understand that your book’s only market of importance will consist of academic libraries—and those institutions will not purchase any book which is already available in dissertation form on the Internet, whether in open access or on ProQuest. The dissertation title, of course, is one give-away: A book laden with one might be added to a ‘do not buy’ list. (Which brings up a related piece of advice from Singerman: “Don’t waste your title on your dissertation if it’s the perfect title for the book.”) Unfortunately, just changing your book’s title is not protection enough: Availability of your dissertation proper on the Internet can also limit your chances for publication. Singerman points out another downside of publishing your dissertation on the Internet: It might be less than prudent to publish a version of your work that will likely be later improved through peer review and editorial revision. The successful book, adds Singerman, takes a stand. A dissertation will usually be more research driven, its argument subordinated to sourcing that is wide and deep. The book switches things around as its research is trimmed and honed to support a strong argument. Nailing down that argument is key: “If the argument has not been made, additional research and writing needs to be done,” says Singerman. Picking the best publisher from the scores of prospects can be daunting. One important factor is reputation, notes Steven Tötösy de Zepetnek, editor of a series on Comparative Cultural Studies at Purdue University Press. “Start with the stars and then go down,” he suggests. Those “stars” are the historically elite presses, Harvard and Stanford among them. At the bottom of the incline, he cautions, are some independent publishers who do not enjoy the reputation required by tenure committees. Your ability to fill that gap can become a justification for your text, notes Abel. “A series editor can, in a very powerful way, make an argument to the acquisitions editor for your book. That’s like having an inside advocate for your text early on.” A bonus is that series editors very often know the best and most agreeable readers in your subject field. One caveat: Not all series editors are active in acquiring new titles; it may be prudent to submit your proposal to both the series editor and the house’s acquisitions editor. Once you’ve prioritized your candidates you can avoid untimely delays in your career by sending your proposal to several publishers at the same time. This practice is accepted and recommended by the industry. However, you must not send your completed manuscript to more than one publisher simultaneously. Feeling self-conscious and shy about all that? Seek help and support, says McClennen. “Maybe networking feels corporate and ‘businessy’ but it is important today. You have to be able and willing to make statements such as ‘I met so-and-so at the University of Chicago last week and he recommended I talk with you.’” Networking can not only help you impress publishers but help you buddy up with good prospects for blurbing your book. Speaking of being outgoing, one of the best sales techniques is to approach acquiring editors at academic conferences, says Singerman. “At any conference that has a book exhibit, one of the people attending from each press will be an acquisitions editor. We’re not there because we’re particularly good at selling books. We’re there because we want to talk with authors about their projects. So take advantage of it.” It’s good to have a prospectus and a CV on hand for those editors who ask to see one. The panelists suggested laying the groundwork by contacting editors in advance to set up meetings. Your approach can be as simple as sending an email saying something like “I’m going to be at the ACLA conference in New York and I’m working on a project about X. (Then give a really brief description). Would it be possible to meet with you there?” You might even take a personable approach by offering to buy the editor coffee. If you haven’t been able to lay the groundwork before the conference, go anyhow and introduce yourself, asking if the editors have time to chat with you about your proposed book. And while you’re there, suggests McClennen, why not buy a few books from those publishers you want to impress? You may want to apply to the new First Books Subvention Awards from the ACLA. The value of the award goes beyond its dollar amount. “The award can be a signal to a press that a manuscript has already been vetted by a committee of the ACLA,” pointed out McClennen, who instituted the program which will grant up to three $3,500 awards each year. To put that amount in perspective, note that the printing and binding cost of 700 copies of a 50-page book might come in around $8,000-$10,000 according to Singerman. Build in overhead, editing and other costs and each title can cost from $25,000 to $35,000. This is perhaps a good place to note that most academic books, particularly first time ones, do not pay author royalties even when called for in the contracts. That’s because sales very often fail to cover production costs. The typical academic book sells only 150 to 500 copies. Even some of the more successful titles rack up fewer than a thousand sales. Have you published an article or two in one of the major journals in the field of the dissertation? “That’s a good thing to note in the cover letter because it amounts to a kind of pre-vetting,” says Singerman. “It shows that you’ve gotten a ‘seal of approval’ already.” But pitch your articles to the most prestigious journals—anything less won’t do. If the published articles are taken from your dissertation, that can add still greater oomph to the vetting process. 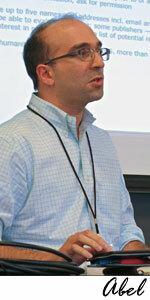 “The publication of a couple of articles from a project makes me want to look at it more carefully,” says Singerman. (If you find yourself trimming your bulky dissertation to meet a book’s word count, consider publishing the castoff material as articles, which you can then tell prospective publishers came from the same project). After the cover letter your submission package should include your curriculum vitae. Then include an abstract or prospectus that goes into greater detail about your project and answers questions such as these: What are the stakes? Why should the editor care? Why is your book important to the field? What are the works or the scholars with whom you are engaging? Follow this with a chapter by chapter narrative synopsis of the book. Finally, include a sample chapter. “The chapter should be one that best represents your project,” says Singerman. “You have one shot to put your best foot forward and your chapter should be part of that best foot.” Bonus tip: While it’s tempting to select the introduction as your sample chapter, avoid doing so if it is simply an elaboration of the prospectus proper. Include important supporting materials at suitable places in your proposal. Anticipate special production requirements such as color or photography. Include a list of names of experts whom your editor might ask to read your book. And ballpark a word count. Singerman notes that 90,000 to 100,000 words is the sweet spot, with the lower limit at 70,000. In specialized fields books of 150,000 words sometimes gets published, but are very expensive to produce. Once your submission is in, how long should you wait before following up? Here’s advice from Singerman: “If you haven’t heard after a month–or better yet six weeks–it’s perfectly fine to send an email saying, ‘I’m following up on my submission. I wonder if you have a chance to look at it.’” No one wants to be a pest, but sometimes submissions do slip through the cracks. Singerman takes on some 36 new books a year and at any one time is handling about 100 projects at various stages of publication. “We are hugely understaffed and overworked,” he says. So how long does all this take? Maybe longer than you expect. You want to draw up a realistic timeline that will produce a finished book at the right time—just before you apply for tenure, for example. Think about any awards you want to apply for—such as subvention awards—and factor their deadlines into your personal timeline. “You have to figure out in a strategic way how those timelines are working with you and against you.” Of course, if your book is not a necessity for your tenure, then the timeline is less of a concern. That would be true for those institutions that only want to see your published articles. The actual decision process, added Abel, can itself add a lot of front end time. Abel’s experience is illuminating: The series editor who eventually accepted his book took three months from proposal submission to ask for a couple of sample chapters. It took another three after those sample chapters were submitted before he asked for the complete manuscript. Then it was another three months before the series editor told his decision to the acquisitions editor and sent the book out for review. Finally, it took from three to six months to get all the reviews back. Footnote. Because academic presses have decided their wares need to look more like trade books, they now use end notes rather than footnotes. And some editors and publishers accept neither. So ignore this.